Sometimes you do get it, but you don’t know what to do about it. When it comes to SEO and websites, Meta tags are a thing of the past. Google no longer cares, or looks for them. What you need now is a WordPress plugin. 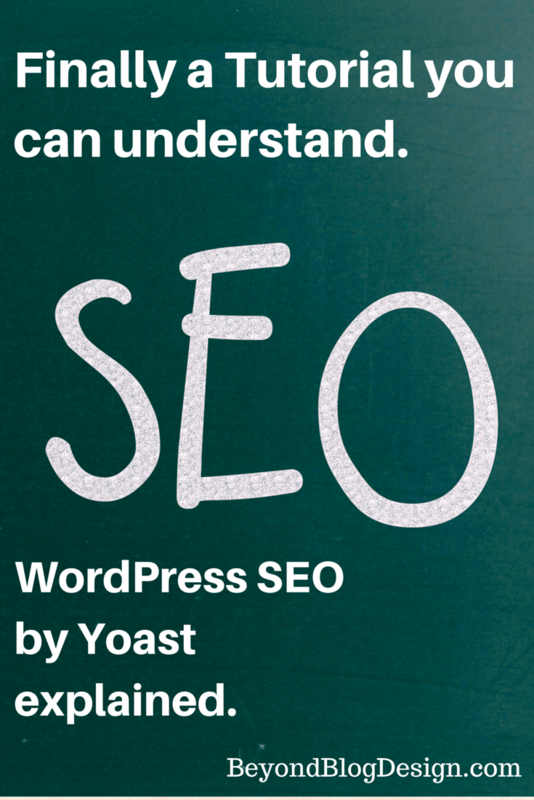 While there are a few to choose from, the best option out there, that is now fully endorsed and integrated with WordPress itself, is Yoast SEO. The great thing about WP SEO is, it is basically plug and play. It also eliminates the need for any XML sitemaps, so if you are using a plugin for that, you MUST deactivate it. 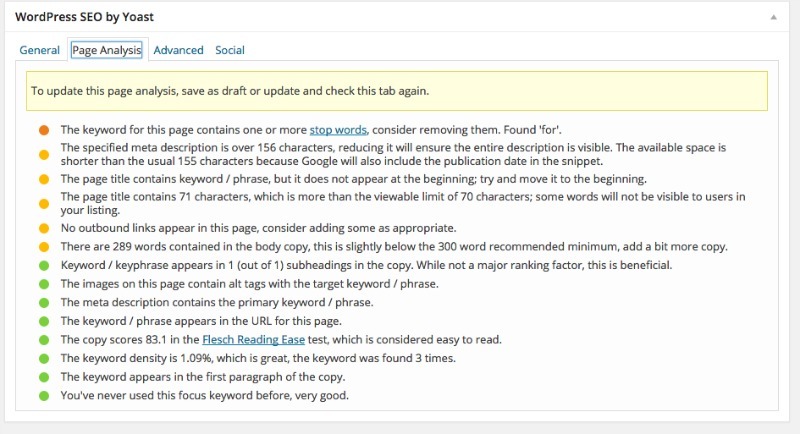 WP SEO automatically sends out a new sitemap every time you make a change to your blog. Yea! In your dashboard, go to plugins > click on Add New > in the search box type WordPress SEO and install and activate. Here is your easy WordPress SEO tutorial for blogs! Since originally publishing this post, I have created a screencast for installing and setting up this plugin. If you love screencasts, here you go! Otherwise see the directions below. Alrighty. If you don’t already have it open, click on SEO and then click on Social. This is the only place you really need to touch anything. See the little tab that says accounts? Go ahead and enter any of the accounts you actively use and Save Changes. If you would like to use Twitter Cards, this is where you do that. If your site is not already verified on Pinterest, this is where you would do that. If you have a Google Page for business, not a personal page like most of us do. This is where you would attach that. Now your WordPress SEO is all set up for your blog! But wait!!! The amazing thing about WordPress SEO is not that it sends all of your information out to all of the popular search engines, it is not that it generates a new XML sitemap every time you update your blog, it’s this; you get to identify the best SEO for each of your blog posts. 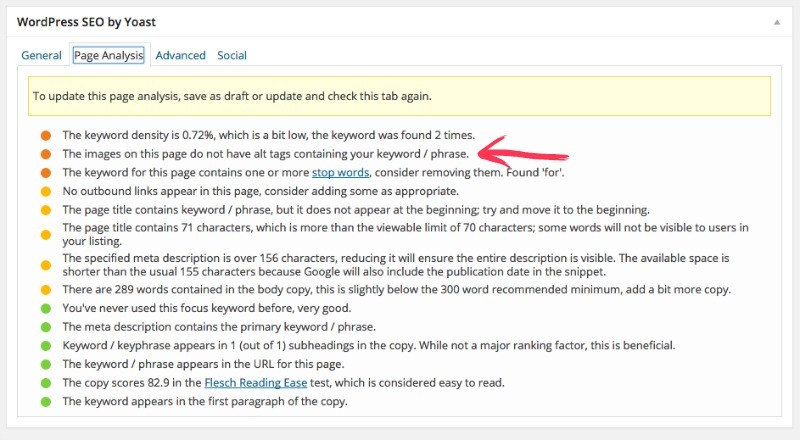 How to make sure the SEO for your blog post rocks! In order to have EXCELLENT SEO you will need to fill out a few things, but don’t worry! WordPress SEO will tell you if you’re on the right track. Decide what your keyword or keyword phrase will be before you write your title and post. I often choose this route because I feel like it’s easier to manipulate the keywords. Decide what your keyword or keyword phrase will be after you write your post. Sometimes it is easier to write the post first, then figure out what it’s all about, and how you feel someone would search for it. That is what I wound up doing with this post. For this example, we are going to choose our key phrase first, with the increase of SEO aware websites, it has become best practice to choose a key phrase (not just a key word), and try to make it the least obvious of your obvious choices. The first thing you want to do is incorporate your key phrase into your title. Sometimes, when you’re snarky or poignant or like listicles, it’s not always easy to incorporate your key phrase into your title, in that case, just make sure your key phrase is in your permalink. To change your permalink, you just need to click the little “edit” button, next to your permalink. The box will open up and allow you to edit. Just make sure your key phrase is in there, with each word separated by a dash. *Occasionally WordPress will change your permalink and it won’t actually match your title exactly, so always check your permalink to make sure your key phrase is, in actuality, in there. Don’t worry if you still have a red “no” here and there. You’ve only just started, but now you know what you need to work on. Article Heading – This is your blog post’s title. Page URL – This is your permalink. It should be a “Yes” if not, go back up a step and change your permalink. Now Go Write Your Post! You will see something close to this. Your goal is to have as few red lights as possible. If you know what an “alt tag” is, then you’re good. If you don’t, no worries! *Update, using alt tags is no longer a good thing. Google is not reading images anymore because people were using them to increase SEO and Google doesn’t like to be tricked. They are now only using them to update Google Image Searches, and as bloggers, we all know what people do with Image Searches. They steal your images. The great thing about Page Analysis is, it tells you what to do. As long as you only have one or two red lights, you are good to go. But if you want to be totally OCD go for it and try to turn all those lights green! You may have noticed the last time you hit save draft, a green light in your publish box showed up. That green light is your SEO check. As long as it’s green, you’re good to go! Every time you make a change to your SEO, either in the “General Tab” or on your post, hit save draft and check the light. Once the light is green, you can stop trying so hard and get publishing! Some of you wish that you could change how your post appears on Facebook. Well, here’s your White Knight! 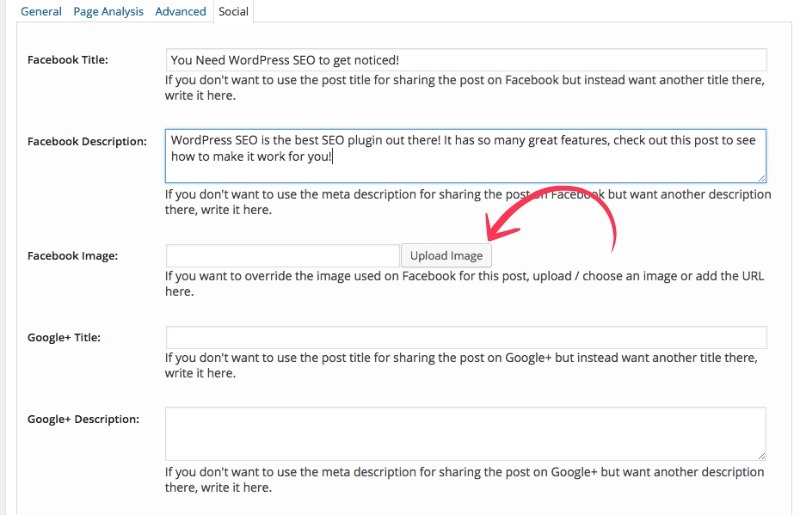 Click on the “Social” tab of WordPress SEO by Yoast at the bottom of your post. Yours will be blank. This is the gist. You can change all of these elements for each specific post. Facebook Description – Yup, just what you think. Right now, WP SEO is going to pick up your Meta Description for Facebook, but if you want it to say something different, more descriptive, stick it in here. Facebook Image – Some themes default to a weird image, even if you choose a “Featured Image” for your post. This is where you can stick an image to guarantee you get the image you want attached to your Facebook post. Rinse and repeat if you want to change the same information for Google+. One more little tidbit; Search Engines LOVE back links. Back links are links in your post that go back to a previous post about a similar topic. Many of my clients say they don’t like back links because they seem so obvious. When you are trying to think of blog post titles that incorporate your key phrase, make sure the title still has some pizzazz. A high-ranking post isn’t any good if no one wants to click on your boring words. Notice how blog post titles is a link? It’s a link back to my post about rocking blog post titles. But is it obvious? No. The words occurred naturally in my post and I chose to link them back. Be creative, fudge it if you have to, let it be loosely associated with the topic. But try to have at least one back link in your post. I tried to make this an easy WordPress SEO tutorial for blogs. Before I learned tech and was a blogger myself, so many pieces of the puzzle were, well, puzzling. The tutorials out there in the “real world” were difficult for your average blogger to understand. And when I didn’t understand I was often afraid to ask. I hope that I have made this easier for you, and please, as always I welcome questions! Please contact me for a free 30 minute consultation, or leave a comment with any question you may have! I also have a Facebook group just for Blog Tech Help. Keep in touch! I run a company that offers website support and have installed this SEO plugin on several of the sites I manage. I’ve sort of understood how to work the settings, but never felt like I was doing it correctly. Your post has cleared up my confusion and I feel like I really have a great understanding of this plugin now. I know I can offer my clients a great way to manage their SEO now. I just want to tell you thank you so much for the tutorial and encouragement through out your instructions. My keyword suggestions stopped working. Has something changed? Used to spin and offer suggestions; now it’s a static button. It hasn’t stopped working, as part of the last update they removed that function. I haven’t seen any documentation on it yet, but I am guessing it has to do with the fact that it has to reach out to Google to get you the information you need. And anytime a site has to go somewhere else, it slows you down. Read my latest post, I offer more suggestions on SEO, and how to search for keywords. Also, are you part of my Facebook group? That’s a great place to ask questions like this! I set a social image in Yoast for Twitter, along with the # that I need to be used for the sponsor. But when it’s shared via shareaholic buttons it doesn’t use any of the info I’ve put in. What am I doing wrong?? Crystal, to the best of my knowledge, the only way Yoast and Shareaholic work together is the keyords help determine related content. As far as the Twitter card, it will show up when using the Publicize function of Jetpack, but when someone uses the Shareaholic buttun to share on Twitter, Shareaholic grabs it’s own Open Graph information. It doesn’t go through Yoast. Oooo, this one I really love. I actually made it myself such a tutorial for slovenian market and one thing I’ve noticed when sharing it. It is by far one of my most shared content. Yoast is really simple and friendly to use. Thank you Matija! I think the regular version is great too, but I have decided I am going to do a trial of premium to see how it works so that I can share it with my readers. Thank you for stopping by! What a great tutorial. I agree it is a great plugin and so easy to use. Thanks for the comments on Shareaholic. I found it difficult sometimes to see how some plugins work together or not and how they pull info from other. Great find! Great tutorial. I agree easy to use and install. Thanks for the comment on Shareaolic. I find it difficult sometimes to work out where do they pull info from. Great find!